We checked in at Vistana Hotel Kuantan at about 6 pm. 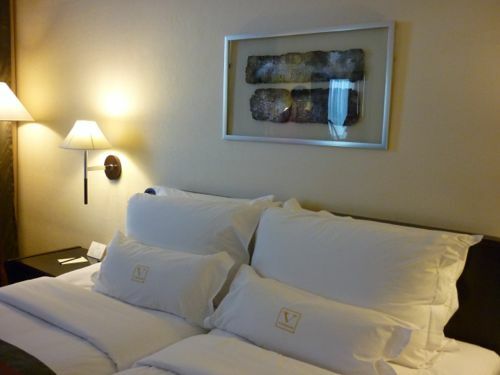 It is a small hotel but the all-white building is clean and well-maintained. Though it is only a 3-star hotel, the service is excellent: from bell boy service to parking attendant. Yes a hotel staff was there to guide me while I was back from town trying to park my car at the hotel. Excellent service. 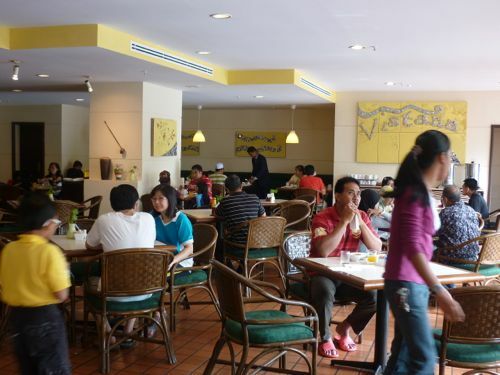 The breakfast buffet at Hotel Vistana was way better than what we had at Primula Beach Hotel Kuala Terengganu. Even though the restaurant is not big, but the buffet spread was excellent. And the food there was fine too. We wanted to have dinner at Tanjung Lumpur – a small island off Kuantan. But we couldn’t find the restaurant that was on our list. In the end, we settled for Sara Thai Kitchen in Kuantan town. The restaurant was packed and fortunately we managed to get a table when we arrived. Overall the food is salty but the prices are highly affordable. 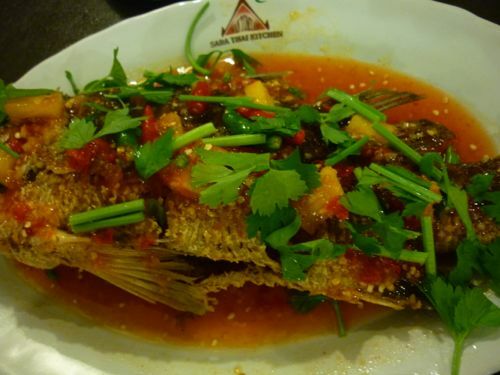 We liked the Ikan Siakap 3 Rasa best. Prices: Small servings: Ikan Siakap 3 Rasa RM30. Mixed tomyam RM6. Kangkung belacan RM5. Fried squid RM5. After dinner, we drove to Teluk Chempedak (known as TC for locals) for a night stroll at the beach. Teluk Chempedak was crowded and it was not easy to find a parking lot. You can go to the beach for a walk. Enjoying the breeze. Or you walk down the pavement and you will see peddlers selling all kinds of toys and you can even get a caricature of yourself. If you are thirsty or hungry, you can have something at the food stalls there. Teluk Cempedak has fast food facilities too. Take note if you go to TC on a weekend. The beach destination is very crowded on a weekend and parking could be a problem. We went to check out Kuantan River Cruise but unfortunately we were told the service has been discontinued many years ago. Funny thing is when we did our research for the cruise, nobody mentioned that the river cruise (used to be operated by Kuantan Municipal Council) has stopped operational – even on its official website. As usual, the government officials must buck up and keep the information up-to-date. Since we couldn’t go to the cruise, we used the extra time to have a car tour of Kuantan town. We explored Kuantan old town where one can still find old and pre-war houses. After leaving Kuantan, while on the way back home, we stopped in Sungai Lembing – once the world’s famous underground tin mine. Sungai Lembing is 40 km from Kuantan and it took us about 40 minutes to get there from Kuantan. The road leading to Sungai Lembing is winding and narrow. Apparently, from what I saw on the map, the old tin mine town is the last destination you can ever go by that road. 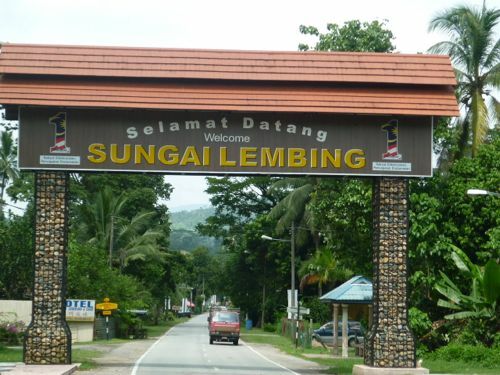 I like Sungai Lembing because it is peaceful, scenic, “down to earth”, and its friendly people. Despite its size, Sungai Lembing has many attractions. Many travelers come here for food, waterfalls, mountains, rivers, and outdoor adventure. One must-visit place is Sungai Lembing Tin Museum. The current museum used to be the house of the manager of the tin mining company. 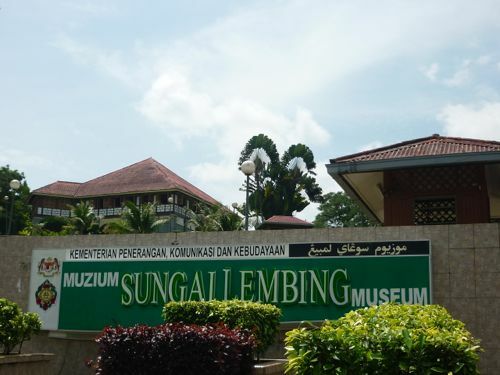 The museum preserves everything about the history of tin mining in Sungai Lembing. Right from equipment to clothing. Sungai Lembing used to the world’s biggest underground mine and it’s amazing how people from olden days could do it without modern technology. The museum is located on a hill and entrance is free. Another attraction which is under construction now (scheduled to complete 2013) is the old tin mining area. Once complete, visitors are allowed to take a first hand tour of the place. In the afternoon, there isn’t a lot of activities going on there. We had difficulties looking for food. Only one or two stalls at the market opened. People claim the food (noodles especially) is special because the cooks use water from the mountains nearby to prepare the food – natural, clean spring water. We also brought home another delicacy of Sungai Lembing – coconut biscuits – 3 packets for RM10. There are lots of low cost chalets available for rent. They are mostly on the other side of Sungai Lembing which is connected by a humble bridge in front of the police station.